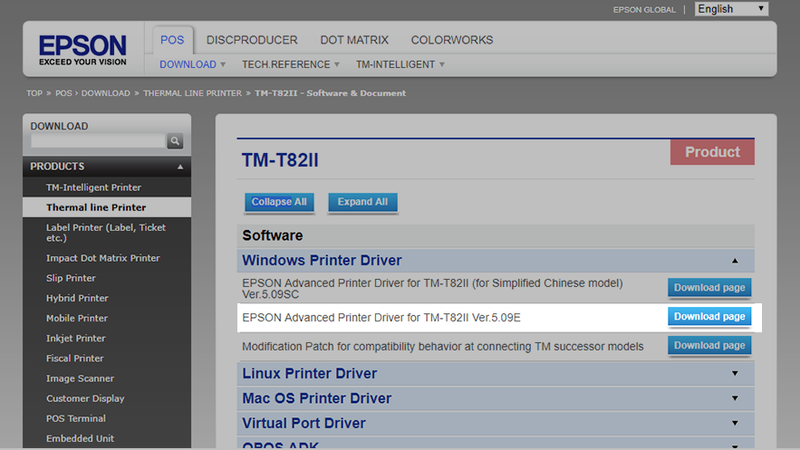 Setting Up Your Epson TM-T82II (USB) for a Windows PC – How can we help? This guide provides step-by-step instructions on installing an Epson TM-T82II (USB) Receipt Printer for Windows Computers. In order to set up your receipt printer with your Windows PC you'll first need to make sure you have all the peripherals needed. You will need a power cable for the printer. Make sure you've got some 80mm receipt rolls ready to go. To load your receipt roll open the latch on the top right of the printer, place the roll inside and pull some of the paper through before closing the lid. You may also wish to set up your cash drawer at the same time, to do this you'll need a specialised cash drawer cable. This is similar looking to an ethernet cable but is smaller on one end. Important: These are the instructions for setting up your Epson TM-T82II (USB) on your Windows computer. Click the following links if you are using a Mac. 1. First, you will need to download the latest printer drivers for your computer. This is specialised software that helps the printer run correctly on your computer. To get this head over to Epson's website here. 2. Find the TM-T82II Driver and click Download page. 3. This will take you to the next page where you will have to scroll down to confirm the download. You should see the download start in the left-hand corner of the window. 4. When this download is completed, head to your downloads folder. 5. Double click on the file and select Extract all. Checkpoint: Not sure where to find the download? Go to explorer and select Downloads from the left-hand list. The download will also appear at the bottom of Google Chrome, click the arrow here and select Show in folder. 6. After extracting the file, the installation will begin. Follow the installation guide instructions. Once installed a printer register box will open. 1. Model: Select Epson TM-T82II from the drop-down. 2. Name: Type in the name of your choice or leave as default. 3. Port Type: Set this to USB. 4. Port: Leave this as Auto setup. Now that your EPSON is installed you can start using it to print your receipts in Vend. 1. Head over to the History tab and click on a sale. 3. Pick the receipt template you’d like to use and click Print. 4. This will take you to the print preview screen. If the Epson is not your default printer, click Change and select the printer from the list. The cash drawer connects to your receipt printer and is triggered to open when you finish a cash or cheque sale, and the printer prints the receipt. Tip: You can manually open the cash drawer by clicking CTRL + E if you are using the old Vend Sell Screen or by performing a test sale if you are using Register for PC. 2. Next, head to your Devices and Printers window on your computer. 3. Right-click on your receipt printer, select Printing preferences -> Peripherals. 4. Once in here, use the drop-down menu to select Cash Drawer. 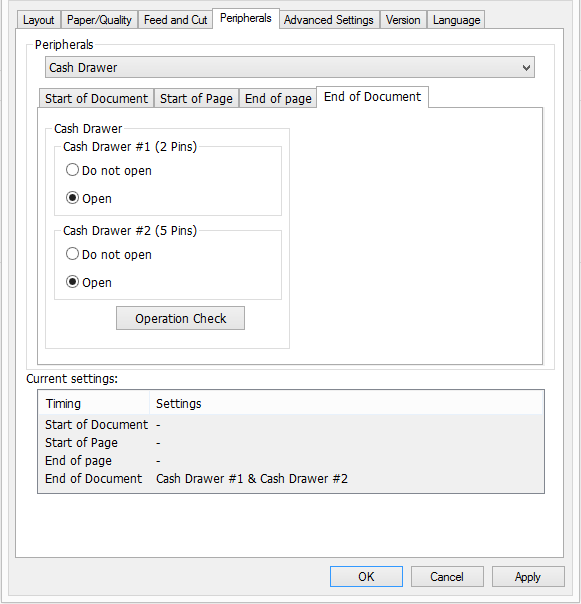 Tip: If you want your cash drawer to fire before the receipt prints you can select the Start of Document option instead. 6. Apply these settings and test it out by clicking CTRL + E on your keyboard when in the old Vend Sell Screen or by performing a test sale if you are using Register for PC.